If you have any questions, please contact Barak Hullman at barak@hullman.com. Or call us toll free from the US direct to Jerusalem, Israel: 1-866-842-1095. 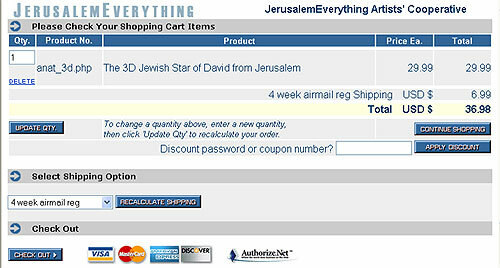 Below are instructions on how to use our shopping cart to place a purchase. To purchase via fax, please click here. If you would like us to call you to take your credit card information and help you with your order, please click here. 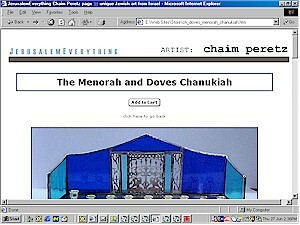 From the home page (www.jerusalemeverything.com) click on the picture of one of the artists whose work you'd like to see. From the artist's individual page, you can chose a specific piece or category you'd like more information on. Just click on one of the pictures on the page to go to a larger image with a description and a "add to card" button OR to go a specific category on the artist's page. 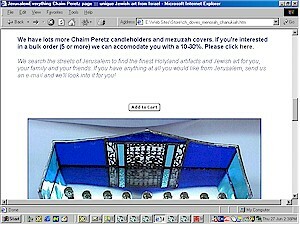 Keep clicking through each page until you get to the page for the piece you want to purchase. Once you're at the page for the piece you're interested in, you can scroll down for more pictures and more information about the piece and the artist. 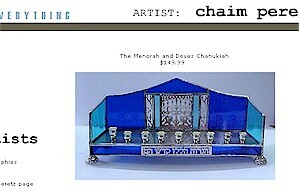 To purchase the piece click on the button. This will open a shopping cart window like the one below. Qty = Quantity --> This is where you can change the number of the same item you'd like to purchase. Delete = Click this box and then Update Cart to remove an item from your shopping cart. Insert your discount password or coupon number here. Then click on Apply Discount. Choose your shipping option: 4 week registered airmail or 3 day express business mail. Continue Shopping = Click this button to continue shopping. Checkout = Click here when you're done and you want to pay for your order. You can pay either with PayPal or with your credit card. We take Visa, MasterCard and American Express--not Discover. If you get stuck or have any questions, or just get frustrated, please send me an e-mail at barak@hullman.com. You can also send me your order via e-mail. Just write down the pieces you want and put them in an e-mail to me. I'll help you through the purchasing process. If you want to print this page and keep it with you while you shop click here. To make a purchase via fax, please send a fax to (USA number) 309-404-7700. We will not charge your credit card until we get an e-mail confirmation from you on your order. After we receive your fax, we will contact you via e-mail, so please be sure to include your e-mail address. To make a purchase via e-mail, please send an e-mail to barak@hullman.com. Please tell me which items you would like. I will then send you a confirmation e-mail and once the order it clear, I will send you an invoice from PayPal or take your credit card number over the phone or fax.